*This is the beginning of the From My Bookshelf posts by jmcartee. Every week(I’ll try to do it every week :P) I’ll post a picture and talk about one of the books on my bookshelf. I hope you enjoy! Ahh yes, The Road. I must say, what a book! I was looking around for some apocalyptic movies and saw this. I read a little about the movie and it said that there was also a book for it. Since the release date for the movie was decided yet, I decided to get the book. I can’t believe how the book grabbed me and entwined me with all of its amazing story. I absolutely LOVE apocalyptic or post apocalyptic books, I mean LLOOVVEE them. My favorite genre of book. When I found out that this was a movie and a book, I couldn’t hide my enthusiasm to go out and get it. I read the book in a very short time and loved every bit of it. It doesn’t have any names in it which is pretty interesting. The protagonists are simply “Man” and “Boy”. There is an old man in the book and guess what his name is. 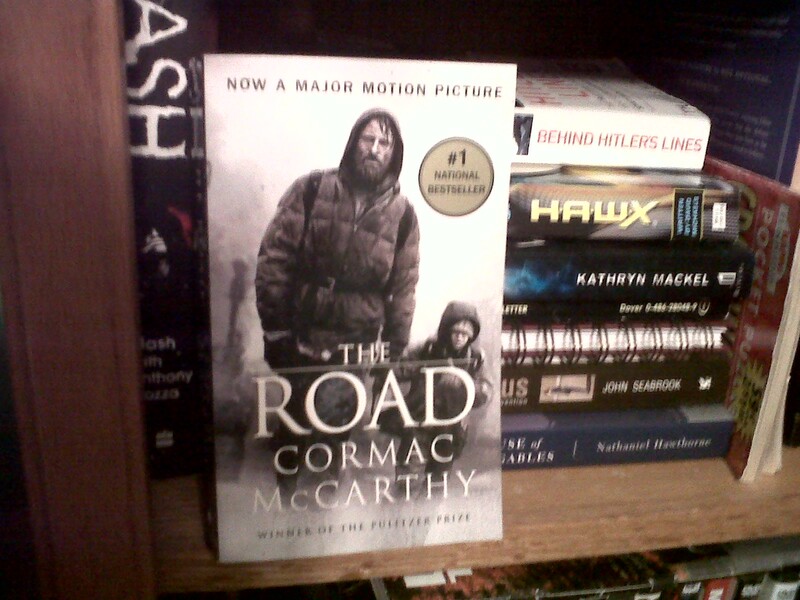 This is the only book by Cormac McCarthy that I have read and I hope to read more. This book makes you feel like you’re walking down the road right beside the boy and man. That’s how good it is. So if you haven’t read this book yet, go out and get it. You will not regret it. I suggest reading the book before. It’ll help you understand the movie a little bit easier. This is in my top five favorite books. I can’t even tell you how much I absolutely love this book! *Cormac McCarthy was even on the site when filming the movie as to make sure it got the genuine feel of what he was hoping to get out of the book. The movie portrayed the book very well, but books are always better now aren’t they? I have a copy of this book and I can’t seem to get past the first 20 pages. I’ve read “Blood Meridian” but I think I have a mental block when it comes to “The Road.” I’m going to try and give it another go tonight. Good post. I read this book a few months ago and found it slightly repetitive and boring. The story is amazing and the two main characters are hard not to fall in love with. I can’t say I will ever read this book again, but am glad I did. I will also not watch the movie. Oooh. This looks interesting. I read like half of snow falling on cedars. Yea…kinda meh, but beautiful writing style.